Pauline G. Boogard aged 88, of Grand Rapids, passed away on April 21, 2018. She was preceded in death by her infant daughter; and sisters, Helen Teunis and Marcia Van Krimpen. Pauline is survived by her daughters, Sue Bolhouse and Lynne (Rick) Kalchik; brother, John (Marcie) Griep; and grandchildren, Anne (Mike) Detmers, Chris (Carabet) Bolhouse, Sarah (Josh) Mugittroyd, and Katie Kalchik. She was a precious “Great-Great” to Megan, Andrew and Jacob Detmers, Molly, Charlie, Josie and Lily Murgittroyd and Jameson Bolhouse. Family and friends will gather from 6-8 PM on Tuesday, April 24, 2018 at Heritage Life Story Funeral Homes, 1833 Plainfield Ave NE. Private family services will be held with interment in Rosedale Memorial Park. Contributions in her memory may be made to Alzheimer’s’ Association. 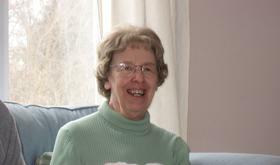 Please visit www.lifestorynet.com to read her lifestory, archive a memory, photo or to sign the guestbook.